This August marks the 226th birthday of the U.S. Coast Guard, originally created as the Revenue Marine in August 1790 by Congress. The Revenue Marine was formed at the request of Alexander Hamilton, Secretary of the Treasury, as an armed service to collect and enforce customs duties at U.S. ports. Though the Continental Navy was created before the Revenue Marine (in 1775), the Navy’s disbandment between 1790 and 1798 makes the Coast Guard the oldest continuous maritime service in the U.S.
By 1894, the Revenue Marine had officially taken on the name the Revenue Cutter Service. 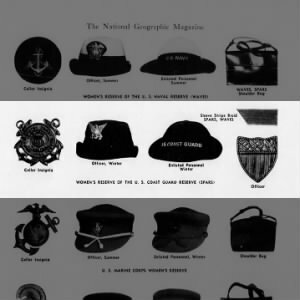 Then, in 1915, the Revenue Cutter Service was combined with the U.S. Life-Saving Service to create today’s Coast Guard; in 1939, the U.S. Lighthouse Service was also incorporated, as was the Bureau of Marine Inspection and Navigation in 1942. The Coast Guard originally operated under the Department of the Treasury (1790), then the Department of Transportation (1967), and finally the Department of Homeland Security (2003); during World Wars I and II, it was temporarily moved to the Department of the Navy. In fact, as one of the nation’s armed services, the Coast Guard has participated in every U.S. conflict since its formation in 1790. The three main roles of today’s Coast Guard are maritime safety, security, and stewardship. To find more documents about Coast Guard history, try using this pre-formatted Fold3 search as a jumping off point. Or start a search of your own. I was surprised to find no mention of Dorothy Stratton, an exceptional woman who was a founding leader of the SPARS as well as a Dean of Women at Purdue University. As I read this article, it a very general compilation of the history of today’s United States Coast Guard. In the main article the only individual mentioned is Alexander Hamilton. The subsequent articles are only examples of a very few individuals whose files are accessible. Do you have a category of ships operated by the Coast Guard? In the 1950s and 60s the New York City police force was larger then the entire U.S. Coast Guard (officers and enlisted men and women). There is no UNSUBSCRIBE link at the bottom of your emails. FTC regulations require an UNSUBSCRIBE option at the bottom of emails such as this. Failure to provide one is punishable by hefty fines. Please provide one so those of us who do not wish to receive these emails can unsubscribe. There is already an unsubscribe option at the bottom of every email. It is right after the body of the message. The text read “Want less email? Unsubscribe from all follow-up comments or modify your Subscription Options.” Simply click on the text ” Unsubscribe from all follow-up comments” which is all a hyper-link.. I agree, there is not an unsubscribe me link in the bottom of the most recent email. Remove me. No unsubscribe button. Remove me from these emails. Thank u. Please unsubscribe me and remove me from your mailing list! If you don’t want emails, don’t sign up in the first place! This site is awesome! Please unsubscribe me from your list! This is an illegal email under the CANSPAM rules. You must include an unsubscribe option along with the name and address of the sender. I want to be removed from this list. I am also reporting this email to the FCC. Why do people keep saying that there is no way to unsubscribe? It shows up every time on my email. Even an option to modify the subscription or op out of all emails from the blog. I am reading my email via a computer as opposed to a phone. Maybe the option is cut off on the phone display. I have modified mines once to see if it works and it does.